RUBICK (AUS) (Bay 2011-Stud 2015). 3 wins-2 at 2-at 1000m, 1100m, A$379,500, MRC Schillaci S., Gr.2, Blue Diamond Prelude (c&g), Gr.3, ATC TAB Iphone App 2YO P., 3d ATC Challenge S., Gr.2, 4th MRC Blue Diamond S., Gr.1. 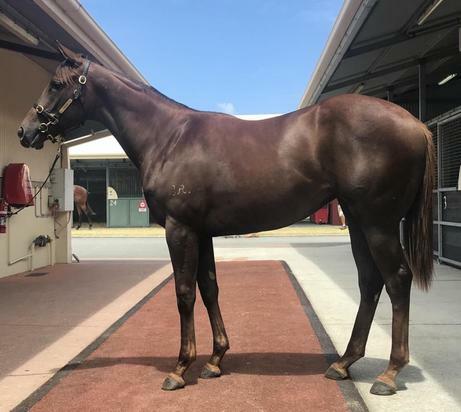 Out of SW Sliding Cube (AJC San Domenico S., Gr.3), a three-quarter sister to SW Redoute’s Choice and SW Platinum Scissors, a half-sister to SW Manhattan Rain and SW Echoes of Heaven. Sire of SP Biscara, Krameric and of Rubic Rose, Yes Yes Yes and of the placegetters Alburq, Chia, Miraculous, etc. His oldest progeny are 2YOs. My Big Boss (g. by Smart Missile). Winner at 1100m in 2018, 3d Singapore TC Aushorse Golden Horseshoe, L, Magic Millions National Yearling Sale S., IRT Juvenile S.
County Commands (f. by Commands). 4 wins to 1050m, BRC Yellowglen H., Coca-Cola Amatil H., 2d BRC CBS Air Conditioning H., Gallopers $1 Membership H.
Mr Picasso (g. by Exceed and Excel). 3 wins at 1200m, HK$2,703,650, to 2018-19, HKJC Helene Mascot H., Kwoon Chung Hengqin Express H., Leighton H., 2d HKJC Perfect Gear H., Fortress Hill H., Bulldozer H., Electronic Unicorn H., 3d HKJC Cheung Sha H.
Satellite Winner (g. by Not a Single Doubt). 2 wins at 1000m, 1200m in 2018, Singapore TC Class 4 H., Wong Chin Chuen S., 2d Singapore TC Chase Me S.
Cinco de Mayo (g. by Northern Meteor). 2 wins at 1200m, 1600m in Aust. Shellac (f. by Commands). Placed at 3 in Aust. ROUNDABOUT JONES (Seneca Jones). 6 wins-3 at 2-from 6f to 8¼f, Louisiana Downs Friendship S. (c&g), L, Sam Houston Park Groovy S., L, 2d Sam Houston Park Texas Stallion S. (2YOc&g), L, 3d Retama Park Texas Stallion S. (c&g), L, 4th Sam Houston Park Texas Stallion S. (3YOc&g), L.
ROCKIN' KATE (Seneca Jones). 5 wins-1 at 2-to 6f, Retama Park Selma S., L, 2d Lone Star Park Texas Stallion S. (3YOf), L, 3d Lone Star Park JEH Stallion Station S., L, 4th Lone Star Park TTA Sales Futurity (f), L. Producer. HANNAH'S ROYALROCK (Superoyale). 4 wins-3 at 2-to 7f, Louisiana Downs Friendship S. (f), L, Lone Star Park Valor Farm S., L, Sam Houston Park Bara Lass S., L, 2d Oaklawn Park Dixie Belle S., L, Martha Washington S., L, 3d Lone Star Park Harold V. Goodman Sprint S., L, 4th Louisiana Downs Delta Miss S., L. Producer. TIFFANY ROYAL (Seneca Jones). 4 wins-3 at 2-from 4½f to 1m, US$231,563, Retama Park Bara Lass S., L, Two Altazano Texas Stallion S., L, Darby's Daughter Texas Stallion S., L, 3d Lone Star Park Texas Stallion S. (2YOf), L. Producer. Roundabout Lass (Seneca Jones). 2 wins at 2, 2d Retama Park Darby's Daughter Texas Stallion S., L, 3d Remington Park EL Gaylord Memorial S., L. Producer. TRACEYS ROCK (Taylor's Falls). 4 wins. See above. Taylors Rock (Taylor's Falls). 11 wins-1 at 2-to 7f, 3d Hoosier Park Merrillville S., L, 4th Hoosier Park Home Grown H., L.
Royal Finder (Superoyale). 2 wins at 6f, 2d Louisiana Downs Friendship S. (c&g), L.
MS CLASSIC SENECA (Seneca Jones). 4 wins-3 at 2-to 7f, Retama Park Selma S., L, Sam Houston Park Bara Lass S., L, 2d Retama Park Lakeway S., L, 4th Lone Star Park Texas Stallion S. (3YOf), L. Producer. MINAJ (Commands). 5 wins-1 at 2-to 1200m, A$256,975, MVRC William Crockett S., L, SAJC Redelva S., L, 2d MRC Twilight Glow S., L, 3d SAJC DC McKay S., Gr.3. Seneca Rock (Seneca Jones). 4 wins-1 at 2-from 6f to 1m, 2d Sam Houston Park Texas Stallion S. (3YOc&g), L, 3d Lone Star Park Texas Stallion S. (c), L, Sam Houston Park Groovy S., L, Retama Park Texas Stallion S. (3YOc&g), L.